This module increases customer trust and confidence and improves sales by allowing the customer to ask questions with ease regarding the product they are interested in. Also customer gets an auto reply from the store. Magnigeeks own developed module named as Products Enquiry which will help you increase sales through better customer interaction. When a visitor is shopping and wants to buy a product it is natural that he might have some doubts about the product. 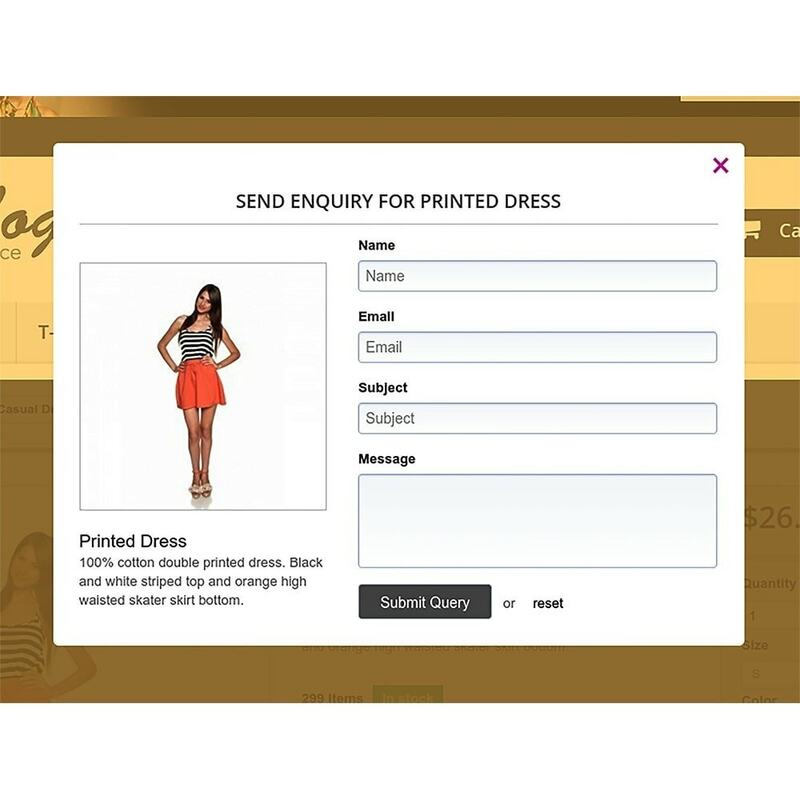 With this module he gets presented a short enquiry form for every product of your store. If visitor wants to know something about the product he can simply and quickly complete the form with his details and questions. The shop admin will get an email regarding the queries of the visitor. The admin or support staff can answer these queries and in this way a visitor can be converted into a paying customer. Visitors can send a message to the shop admin or the support staff without navigating away from the page or needing to open a separate email. This simple and effective method improves the customer experience and increases sales. Also user will get an email from the store for his query. 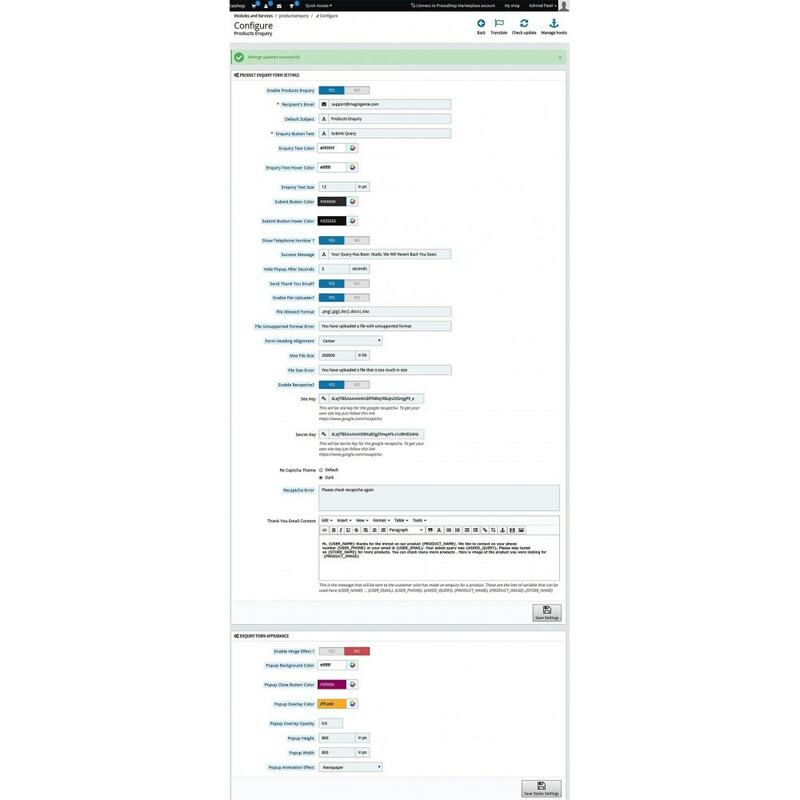 User can upload any file and size which is defined from the store admin panel. The store admin will get that file in the attachment and can get know what exactly the customer is looking for. There is also google recaptcha has been added so no spam or bots will attack your site easily. There are different varaible which admin can use when he is doing replay to the customer. 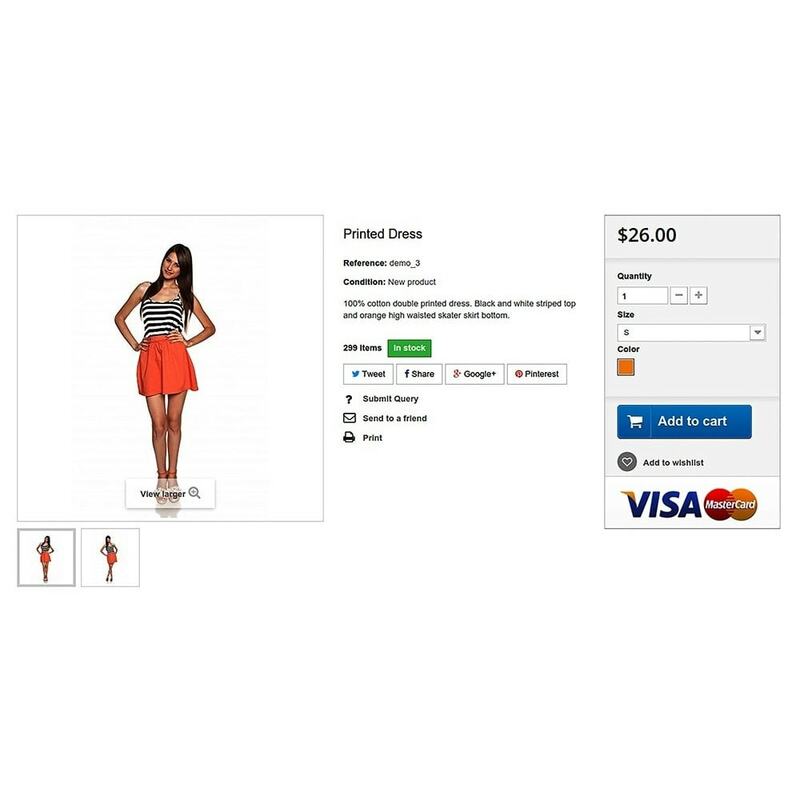 For the customer, he is able to receive assistance on any product in a simple and easy use way and the shopping experience is enhanced. 1. 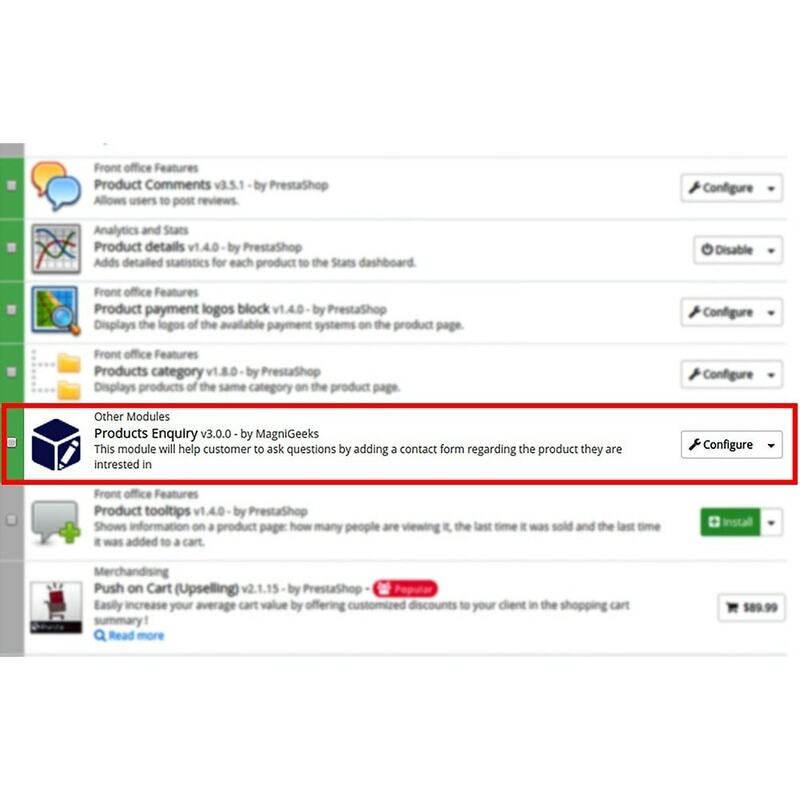 Simply upload the productenquiry folder to your Prestashop installation directory through FTP or any other file upload software. 2. Then login to your store admin panel. Then browse to module section from backend and search for Product Enquiry. 3. Now click on install of the Product Enquiry module. This will install the addon to your store. 4. Click on configure. This will redirect you to the addon's admin panel. There you can see options like Recipient's Email. This is for the email address of the recipient means all the queries from the visitor will be delivered to that email id. Default Subject: This one is for the subject field for the customer query. Lets say customer has not filled any subject in the query form then the default subject which has been set will be used in the subject. Enquiry Button Label: This is the button label for the enquiry. Display Telephone Number Field: This one is an optional. If you want to show telephone numbers to the customer in the form then make it checked.